One cool thing about being a content marketer is that you tend to become an expert in your topic. You probably know an awful lot about your business, your project, or your subject matter. In fact, you might actually know too much about it. It’s called the curse of knowledge. Because we research our topics deeply and spend so much time writing about them, we tend to understand the technical specs inside and out. We have a great grasp of the under-the-hood details that make the thing work. And we think customers want to know all about those details. But most of your potential buyers? They don’t care. To be effective, marketing needs to show exactly what the offering does for the person buying it. The features of your offer are what make it work. The benefits are the results it creates for the customer. What transformation does your product or service empower? What does it allow the customer to become that she isn’t today? Jimmy Choo high heels aren’t coveted because they’re comfortable or well-made. (Even though devotees believe they are.) Women buy them to feel confident and gorgeous. Hybrid cars aren’t popular because they’re fuel-efficient, money-saving, or environmentally friendly. The real benefits are feeling virtuous and smart, with the warm, fuzzy glow that comes from believing you’re saving the world. Your content and copy will never be truly relevant to your audience until you translate your features into customer-focused benefits. Quick, take a look through the last persuasive piece you wrote (blog post, sales page, podcast script) and take note of all of the features you talk about. I have 10 years of experience helping clients exactly like you, so you can feel confident that together we can solve even your trickiest widget problems. Our course is the most rigorous on the market, so you can leapfrog ahead of your competitors. Our grape jam has 50% less sugar and no weird additives, so you can enjoy it guilt-free. In about five minutes, you’ll uncover the weak spots in your persuasive content — the places where you were thinking about you and what you offer, and not about them and what they get out of it. You might not use the words “so you can” over and over again in your final copy — but you will be writing with an understanding of your audience benefits. The curse of knowledge can also lead you to focus too much on what some copywriters call fake benefits. These are the benefits of your product or service that you think are important. And you might be absolutely right. They could be critical to delivering the results your audience wants. The trouble is, the customer doesn’t particularly care. But that doesn’t tell us what the buyer gets to have, do, be, feel, or become by moving forward with this purchase. Features are the specific, convincing details that demonstrate why your solution is effective. As long as they’re tied directly to customer-focused benefits, your buyer will stay interested. This nutritional program stabilizes your blood chemistry so you can finally lose weight … without getting hungry. Our proven process makes you more efficient … and that makes you look like a hero when you deliver your next project in half the time and under budget. This quick course teaches your teenager how to write a masterful college entrance essay … which could be the deciding factor in whether they get into their first-choice school. Take another look at your five-minute benefit check. Any fake benefits in there? You’ve got one more check to make before you call it good. Are the benefits you’ve identified things your audience genuinely wants, or are they things you think they need? Paying for things we need is boring. Spending money on things we want is a lot more fun. That’s why it’s easier to sell big-screen TVs than life insurance. When you’re translating your features into benefits, make sure those benefits are driven by wants. Look for emotional drivers like pleasure, comfort, status, and self-image. You can also seek to put a stop to pain, either physical or emotional. It’s not only hedonistic emotions that can drive behavior — values like patriotism, justice, and fairness can play powerful roles with the right audience. It’s still a pretty good idea, though, to pair them with a little self-interested hedonism if you can. Fair-trade coffee wouldn’t sell nearly as well if those arabica beans didn’t taste so good. We like to think that logical drivers like efficiency, physical health, preventing future problems, and scientific evidence influence our decisions, but, they typically don’t have much impact. But those “rational” benefits are helpful when they’re used to justify an emotional decision that’s already been made. The customer who already wants the beautiful high-heeled shoes tells herself that Jimmy Choos will last longer and feel better than a cheaper brand. The customer who already wants to feel enlightened and virtuous tells himself that the fuel economy of the Prius clearly makes it a sensible choice. There’s an important difference between putting your best foot forward and crossing the line into manipulation. Don’t omit significant things that are true. The impression you create with your marketing needs to be realistic and truthful. If it isn’t, you’re a con artist and a creep — and your audience will rightly shun you when they figure that out. 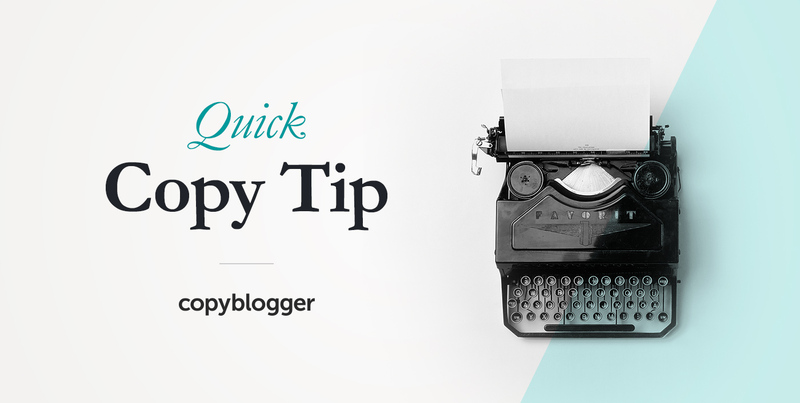 If you liked this Quick Copy Tip, click here to read other posts in the series. Another great post, Sonia! Although I’m reasonable new to the online marketing world, I owned a brick-and-mortar business for 20 years where the same rules applied. What you’ve shared are true and right as rain! Thanks for sharing this excellent checklist! Wow! This one article taught me more about writing better copy than anything I’ve read in last few days.I’ll make sure I apply the 5 minutes feature-benefit check to my landing pages from now. Research shows about 50% of deaths in road accidents occur due to head injuries. Protect your head with our rigorously crash tested helmets and enjoy worry free rides. Our rigorously crash tested helmets protects your head better. It makes your rides safer so you can enjoy the long rides without any worry. Thank you for posting this article. These ideas are indeed helpful for better content writing strategies marketing of our business blogs. This is the most beneficial article for me at this moment. Thank you.